Running with friends makes the treadmill more enjoyable. 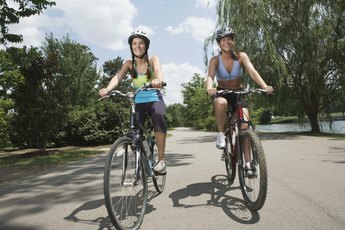 Improving and maintaining your overall health requires incorporating regular cardiovascular exercise into your lifestyle. When running on the treadmill is your aerobic exercise of choice, your fitness gains include weight loss, a more efficient heart and lungs, increased longevity and an improved mood. The caveat? Earning these benefits requires spending a minimum of 75 minutes per week running on the treadmill. Vigorous-intensity cardiovascular exercise such as running on a treadmill raises heart rate and deepens breathing, resulting in a lower resting heart rate, according to the Centers for Disease Control and Prevention (CDC). When you perform these activities for 10 minutes -- or preferably longer -- on most days of the week, a stronger heart improves your health over the long term. Your heart is a muscle, and when it becomes stronger from prolonged periods of intense use, it pumps more blood during each beat. When the heart doesn't have to beat as often to push blood around the body, health improves. Outdoor runners earn these same heart-strengthening benefits but lose out on what the treadmill offers. Because treadmill runners don't have to worry about dangerous hazards such as traffic, weather and road conditions, they can stay focused on higher-intensity exercise, thus increasing health benefits further, according to the CDC. Indoor runners also can store water on the treadmill, which reduces the risk of dehydration; they also reduce skin cancer risk because they are less exposed to the damaging ultraviolet rays of the sun. Plus, it's easy to simulate hills and adjust speed for interval training on the treadmill, as well as track calories burned and pace. Running does more than strengthen the heart and lungs, according to the CDC. People who run regularly prolong their lives, because running burns dangerous visceral, disease-causing fat. Runners also earn strong legs and glutes, and increase endurance over time. They shed pounds, because running requires a lot of calories. 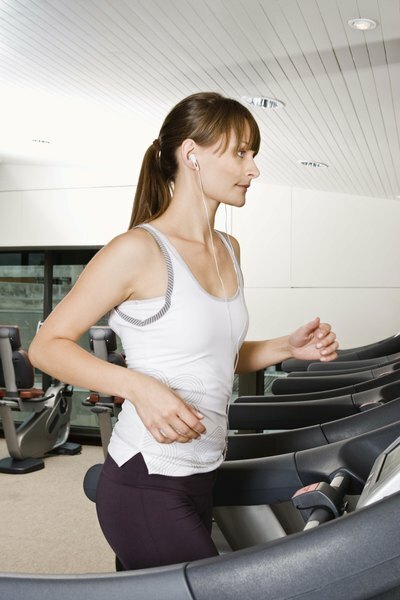 The euphoric feeling that runners get following treadmill exercise improves mood all day long. 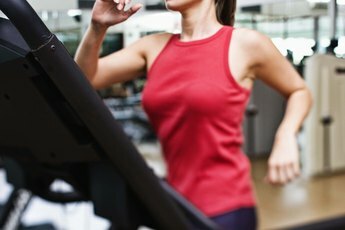 And although beginners may find logging 45 minutes on a treadmill exhausting, running eventually increases energy, according to the American Council on Exercise. Before you lace up and hop on your treadmill, consider the risks of running. First, running is a high-intensity activity and it will pound your joints hard -- although ACE notes that flexible treadmill decks cushion hard footfalls. Nevertheless, if you have lower-body joint problems, another alternative may be wiser. Also, before you take off at a fast clip, spend time warming up first to reduce your risk of injuries such as torn or strained muscles. Drink plenty of water, because dehydrated muscles don't perform as effectively, according to ACE. Finally, take it slowly and let your treadmill running regimen develop over time. As tempting as it is to start out at a 20-mile-per-week pace, do too much and you might derail your training before it's even begun.